Bif Bang Pow and Entertainment Earth team up again for another SDCC15 Exclusive. This time it is a Twilight Zone set from the episode Five Characters in Search of an Exit in color. They are offering the chance to pre-order the set from Entertainment Earth in the event they do not sell out during SDCC. 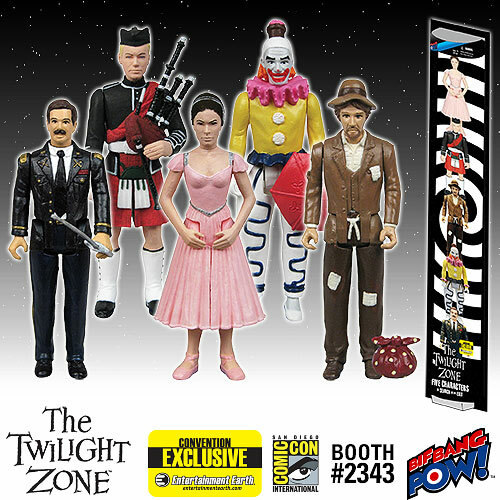 Order Twilight Zone Five Characters 3 3/4-Inch Figures- Con. Excl. from Entertainment Earth! All figures feature 5 points of articulation, including: neck, shoulders and hips. As an added bonus, the figures come packaged in a special stacked ladder formation inspired by the well-known scene from the episode! At only 600 sets, this individually numbered limited edition may disappear to another dimension soon. Ages 14 and up. See all the figures in the Twilight Zone line in the Archive! This entry was posted in 1:18 Action Figure News, Retro-Vintage 1:18 Action Figures, Science Fiction 1:18 Action Figures and tagged 1:18 action figures, 3 3/4 action figures, Bif Bang Pow, Entertainment Earth, Exclusives, retro action figures, SDCC, SDCC15, Twilight Zone. Bookmark the permalink.